Guar has been cultivated in Pakistan for ages for use of its tender pods as fresh vegetables and other parts of the plants to be used as cattle feed. During harvesting period it again needs good sunshine in order to dry up and become Guar Seeds useable for industries. It is extracted from the Guar seed. Guar Gum Refined Splits (Endosperm) is the sole raw material for processing Guar Gum Powder for Pharmaceutical and Food Grade material. Guar gum is an emulsifier, thickener, and stabilizer approved for use in a wide range of foods, cosmetics, and pharmaceuticals. Guar splits and gum powder are further processed to make various derivatives as per requirements o f end‐user industry such as petroleum, Textile, Paper, Food and Pharmaceuticals etc. Which are especially good on salmon and other fish. This quality sesame seeds can be used with salads, fish, butter or meat dishes, bean and noodles dishes, cheese spreads and egg salads, butter or cheese sauces, cakes and cookies beside butter spread and breads. Qusuri methi are dried fenugreek leaves origin from Pakistan. It is used in cooking and taste similar to a combination of celery and fennel with a slightly bitter bite. Typically the leaves are crumbled and sprinkled over meat and vegetable curries before serving. With the assistance of our team, we have been able to provide our valued clients with the best-in-class Linseed. These seeds are mainly produced for oil, the oil is used for manufacture of a variety of products like soap, water proof fabrics, varnish, paint and many more. Fennel seeds can be found in geographical HOT countries like Pakistan, Egypt and India. It can be use in Chinese remedies, Italian Sauces, Turkish snakes and Vietnam Food. We offer castor seeds from Pakistan which is used for crushing to make oil and the health benefits of castor oil include relief from rheumatism, menstrual disorders, and constipation. It also helps in oral care, proper lactation, birth control, hair care, and skin care. Turmeric, an herb from the ginger family, is a powerful antioxidant and supports healthy inflammation. We are processing and grinding from Turmeric whole which is known as one of the ingredients used to make curry. Turmeric comes from the root of the Curcuma longa plant and has a tough brown skin and a deep orange flesh. We offer best quality of cumin seeds origin of Pakistan, Afghanistan and India. We processed with our well equipped cleaning machines and grind the coriander seed to offer our best quality. Coriander is an extremely popular spice with a pleasing lemony flavor. Its aroma can often be detected in Asian curries; it is also used in European cooking. It enhancing the flavor of Chinese soups, Indian masalas Pakistan masalas and Mexican salsas. Hallion grows largely in the province of Sind, Pakistan as well as in India. Hallion is mostly used in medicines. We are offering the best price to different international markets. It is a common sight in Pakistan, India to see mothers and grandmothers handing out ajwain seeds to family members who have an upset stomach. Carom seeds or bishop’s weed also known as ajwain is a common herb found in Pakistan, Indian households and is well known for properties that make it one of the most used home remedies. But other than being a good digestive aid, it has a number of other health benefits. Hulled sesame seeds are extensively used in breads, burgers, sauces, cereals, crackers, spreads, drinks, granola, candies, soups & various other bakery and confectionary products to enrich its taste and nutritional values. Because of our distinctive process of hulling sesame seeds, the nutritional qualities of these seeds have rich proteins, Iron, calcium & phosphorous & and other important minerals are absorbed from the seed to the digestion system of a human being. As the skin is removed it makes the seed easily digestible. We offer natural seeds, cleaned natural black sesame seeds that are mainly used for flavoring various bakery products. These sesame seeds are rich in calcium, protein and B-Vitamins. Our natural black sesame seeds are also be sprinkled on several varieties of vegetables, noodles and even in rice. Sesame seed comes from the family of “Sesamum Indicum”. 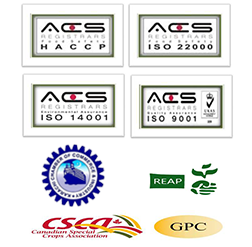 The originations of these seeds are from the top quality soils. Our vast experience and expertise in the business of sesame seeds has made it possible for us to process purity 99% to 99.90% & offer best quality of natural white sesame seeds whitish 99% with 1% black/brown, whitish 98% with 2% black/brown and whitish 95% with 5% black/brown max. Red Chillies powder is grind from whole red chillies without stem which is mostly used for Pakistan, Indian, Mexican and other Asian countries curry as well as best flavored for hot sauce. We have the best quality of Red Chillies powder to offer in the local as well as international market. Mustard seeds are an excellent source of selenium and a very good source of omega-3 fatty acids and manganese. They are also a good source of phosphorus, magnesium, copper, and vitamin B1. Pakistan had started the export of Yellow Maize from 1st quarter of 2008 and we are proud to export the same to join the list of pioneer exporters from Pakistan to the world. Yellow Maize is used for animal feed and we offer the best quality of maize. Pakistan production is about 4.5 millions tones of Yellow maize per year. We have the best quality of Red Chilli Round (Dandi cut) means without stem. These unique flavored chillies grow in Sind, Pakistan. We are not only the major supplier of these chillies all over Pakistan, but also we export to various international market. Pakistan produces many varieties of good quality rice in the world. Among them Basmati rice is the most superior. Pakistani Basmati Rice is non-glutinous, aromatic long grain slender and scented rice. It is the world’s best rice one can use for cooking. The presence of Basmati rice in royal menus of various cultures as the main dish has made it queen of rice, which grows in Pakistan. Distinct fragrance and delicious taste signifies Super Kernal’s best quality. Along with these, we are exporting several other good qualities of rice produced in Pakistan, which are listed below.